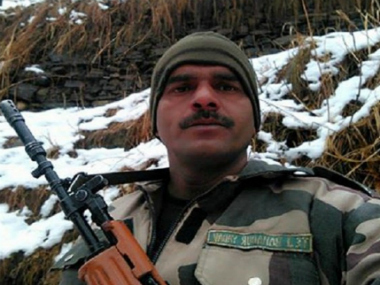 The dismantling of BSF jawan Tej Bahadur Yadav has begun. Instead of talking about the questions he raised in a series of videos about the way soldiers are treated on the border, the BSF has resorted to the strategy that appears to be a standard operational procedure in such cases: Ignore the complaint, discredit the complainant. Only an independent inquiry can reveal if the charges are right. Only a probe can reveal if there is so much corruption in the security forces that rations are sold off and soldiers are made to starve. But, the immediate response from the BSF is troubling. According to reports, the BSF responded by calling Yadav a “bad hat” and asserting that the food provided to soldiers of was of good quality. It then went on to dismantle Yadav by pointing at his difficult past and history of run-ins with the superiors and subsequent disciplinary action. The BSF claimed that he was a habitual offender of absenteeism without permission, chronic alcoholism, misbehaving and using force with superior officers. “Constable Tej Bahadur as an individual has a difficult past. From initial days of his career, he needed regular counseling. Different correction mechanics have been applied for the individual’s welfare as he was a habitual offender of absenteeism without permission, chronic alcoholism, misbehaving and using force with superior officers and certain other acts against good order and discipline. For such reasons, the individual has served mostly in headquarters under the supervision of some dedicated superior officer,’ the BSF said in a statement. The BSF then added that in spite of Yadav being a bad hat, a proper time has been devoted to individuals improvement as a welfare to the individual. ‘He has been sent only 10 days ago to the (current) place of deployment on road head to facilitate support to high altitude forward locations which he has shown in the current selfie, on an experimental basis to observe the improvements of past counseling. ‘DIG and Commanding officer visited him and other BSF jawans present in the strength of about 20 in last one week and there was no complaint from anyone,’ the statement said. Read it again. The image that you get from the BSF statement is a “troubled soldier, a habitual offender, an alcoholic with behavioral problems,” a “bad hat” that needs to be counseled and disciplined. Even if that is true and not just a blatant attempt to discredit Yadav and his complaints, the BSF still has a lot to answer and explain. First, what is this “deeply troubled” soldier doing at such a difficult post — a high altitude forward location? Should not he have been having a proper ‘downtime”, an opportunity to recover from “behavioral problems” at a post that did not put him under more duress, stress and pressure? What sort of psychological healing prescribes putting a troubled soldier on an “experimental basis” under tougher conditions? Does this not sound eerily similar to Jack Nicholson’s Code Red to private Santiago in A Few Good Men? If this is how soldiers are supposed to recover from their problems, there is no surprise that they resort to the extreme measure of breaking the code of discipline, going public with their complaints, are forced to draw the attention of the nation and its prime minister. A similar debate raged through the US recently over private Bowe Bergdahl, who spent more than 1700 days as a prisoner of the IS. After he was rescued, Bergdahl was charged with insubordination, desertion — some even called him a traitor — because Bergdahl left his post, became Awol, and walked straight into IS captivity. Investigations later revealed that Bergdahl was so desperate and upset at his base in Afghanistan that he wanted he wanted his absenteeism to draw attention to the poor conditions there. He said his plan was to hike about 18 miles to a nearby base, thereby triggering a missing soldier alert. After what he imagined would be his triumphant reappearance, he hoped to earn a private meeting with a general who would listen to his concerns about dire leadership and safety issues in his unit. The easiest way for the BSF to deal with Yadav would be to turn him into Bowe Bergdahl of India, punish him for the act, ignore his motive and desperation; to dismantle his character, call him a deranged, disgruntled soldier peddling lies. But, Yadav has raised important red flags about the security forces. The government should not only investigate charges that soldiers defend the country on an empty stomach because of corruption but also how jawans like Yadav are driven to desperation, despair and crossing over the final frontier of discipline.